The University of Cincinnati invites family, friends and neighbors to celebrate its Bicentennial at UC Community Day on Saturday, April 6. This free event kicks off at 8:30 a.m. and features special academic experiences, family-friendly activities, health screenings and entertainment. Kick-off breakfast and panel discussion at 8:30–9:30 a.m., Zimmer Hall, Room 400. UC Foundation Trustees and UC alumni Shakila Ahmad, president of the Islamic Center of Greater Cincinnati; Eric Broyles, investor and serial entrepreneur; and Leigh Fox, president and chief executive officer, of Cincinnati Bell Inc. will discuss the role UC has played in their lives. A sneak peak at “Blind Injustice: An Opera About Six Ohio Innocence Project Exonerees,” 10:45– 1:30 a.m., Swift Hall, Room 608. Tour of Biological Sciences (dinosaur fossils, live snakes and butterflies), noon-2 p.m., Zimmer Plaza. Meet 4 Paws for Ability UC Campus Service dogs-in-training, noon-2 p.m., Tangeman University Center Atrium. Learn about UC’s Formula Society of Automotive Engineers team, noon-2 p.m., Campus Recreation Center, Room 3210. Visit the complete list of activities and registration links for UC Community Day and UC Community Week. The day will culminate with MOMENTUM, a mind-bending, projection-mapping light show. This remarkable display of art and motion is the creation of Brave Berlin, the force behind Lumenocity and BLINK. Activities begin at 7:30 p.m., the show starts at sunset (8:06 p.m.) and the continuous loops of the show end at 9:30 p.m. MOMENTUM will take place on the east façade of McMicken Hall facing McMicken Commons. Live music will be provided by The Touchables. There also will be giveaways, games and food available for purchase. 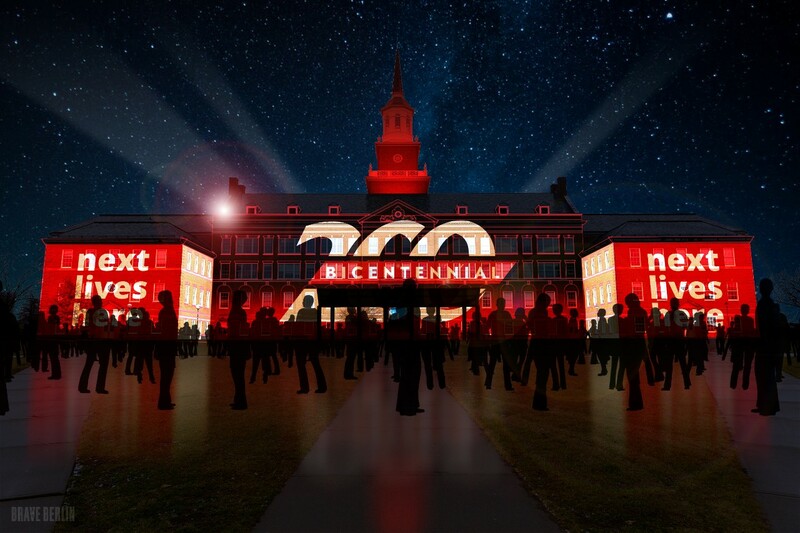 MOMENTUM, a projection-mapping light show, will take place on the east façade of McMicken Hall. Artistic rendering/Brave Berlin.